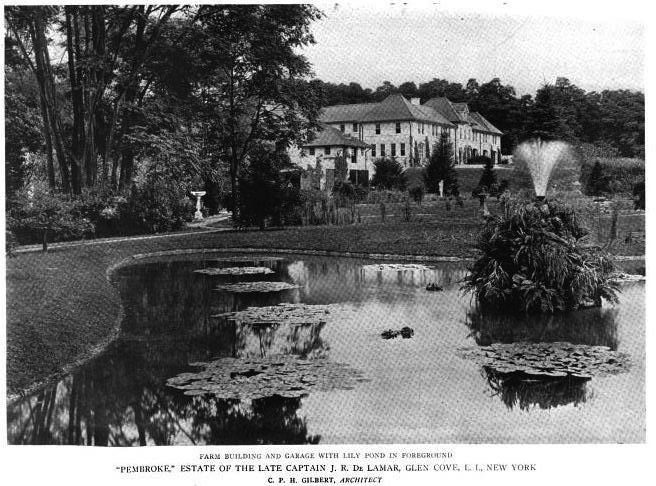 More on 'Pembroke', the Captain Joseph Raphael De Lamar estate designed by C.P.H. Gilbert c. 1916 in Glen Cove. Click HERE for more on 'Pembroke'. Hip hip hooray! Zack gets hoisted high and led around the stadium! Another Pembroke post. You are the best! Love seeing Pembrokes garden views with the formal planting beds surrounded by the lush and mature landscaping that is not prevalent in early photos of the estate. Even the surrounding terraces were lushly planted. What untold gardening maintenance was required to keep such places clipped and weed free? That also had to be some incredible rooftop loggia which is visible on both front and rear facades. 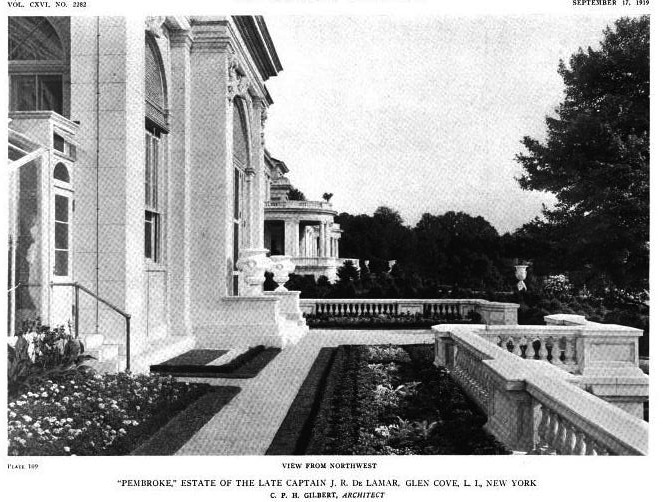 I imagine it had spectacular views toward the NYC skyline and also of the amazing property itself. Plus how can anyone not love that awesomely exotic conservatory with mosaic lined swimming pool, iron gazebo with bridge and the unique fantasy grotto, not pictuered here? Pembroke was a fantasy pleasure palace that only unlimited wealth and a little hubris and a touch of showmanship could concieve. I think I have it correct that Pembroke was built by Delamar very late in life and he actually only enjoyed it for a few years. The Loews family had more years of ownership. First picture: that little encampment on top of this house always reminds me Captain J. R. de Lamar was a seafarer -- & he liked his crows nest. It is terrible looking & was later removed, probably by Loew … possibly by a good, strong wind. 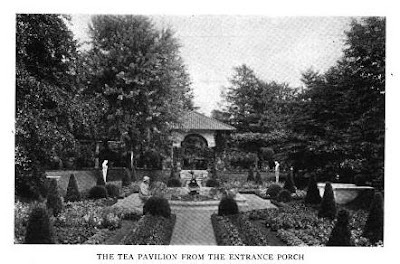 I wish these could have been color photographs -- no doubt the grounds also took your breath away. So the house was finished in 1916 and De Lamar died in December 1918, so he got at most close to three years out of the house. 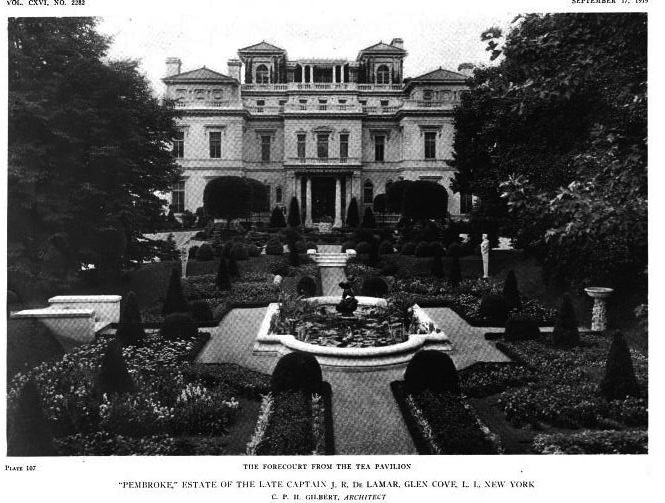 Marcus Loew purchased 'Pembroke' in 1924 for $1,000,000 but would go on to die there in September 1927. Neither of the men got more than a handful of years enjoyment in the house. Loew's son Arthur would have had the longest tenure there. And in completely random news, I discovered a distant relative of mine attended Loew's funeral at Pembroke in 1927 (he was involved in the moving picture business). I love the crow's nest...I would have been perched up there many a sunrise and sunset....thanks Zach, I can never get enough of this place, (and Wheatly). I wonder who the gentlemen in the second photos is? At first I thought it may be the captain, but these photos seem to be after his death. I am in agreement with the comments in the previous post about enjoying a visit regardless of the aesthetic criticism; I would have loved to have seen it! The landscaping is incredible! "Lush opulent beauty" is the perfect description. I hope someone got to enjoy it!! Thanks for providing that link Gary, I was going to attach a link to your blog and it completely slipped my mind. This photo is both incredibly amazing and heartbreakingly depressing at the same time. I must confess that coming across Pembroke at the age of 10 was the spark that ignited a lifelong interest in Long Island's mansions; despite it's less-than-stellar architectural pedigree, it seems to me to be the most evocative of the Gatsby era. 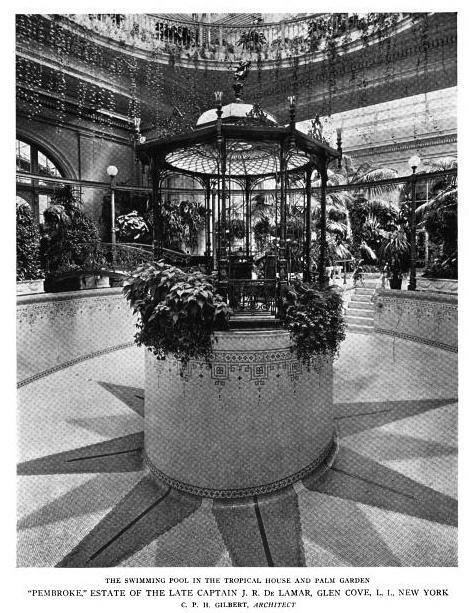 I seem to recall Monica Randall mentioning a Tiffany ball, decorated with a butterfly, hanging above the pool gazebo. I am curious about the modernist house at the base of the pier, long since gone; is this the smaller house Loew built after vacating Pembroke? There's a Schindler-esque quality to it that makes for quite a juxtaposition with Pembroke. It also fascinates me to see the roofs of nearby estates peeking up above the surrounding trees. Security word - humborke: an obsolete Amish musical instrument made entirely of sorghum. What is the source citation for the aerial photograph? Ignited my passion as well! Perhaps my all-time favorite. The aerial view of Pembroke estate, circa 1955, is superb. However, some of the most wonderful illustrations in books are spoiled by using two-page spreads with that 'crease' down the middle. I would rather sacrifice SIZE and prefer to see an intact/unimpaired picture anyday! Old Grey Dog---I am so with you on this (the technical term is split gutter). My first husband, who produced several lavish coffee table books about the movies, had it written into his contract that there would be no split gutters. Another pet peeve, which one encounters often, if the trend toward pages with large pictures in text, and smaller pictures in margins. Almost inevitably, and most perplexingly, the longer view, with more detail, would be the tiny picture, and the closer shots, which could stand being smaller, would be the large. I've seen several serious books ruined thusly. Yes, I always hate that also. Only way is to cut it out and scan it, but even then you lose some of it. They even do it in current magazine photos of great shots, sometimes right down the middle of something important. I am sure it makes the photographers crazy. I will look up where it came from. The building in the postcard is actually called the Bathing Pavilion, so it would most likely be on the beach. But yes, it does seem extremely altered. I read someplace that was what the new building was converted from. Looks like a completely new building. But so often modern renovations can entirely obscure and old building where almost nothing is left except for one wall or a chimney. I read somewhere that Eliz taylor and Richard burton honeymooned in a house on the water, at Pembroke. Could this be it? I think that the removal of the crow's nest was a great loss...it looks somewhat naked without it. As a follow-up to Gary's post about the SPLIA lecture on the Vanderbilt homes. I attended and to be honest the discussion was interesting with those quirky little tidbits that only someone with great knowledge on the subject could throw into the discussion, but the quantity and quality of the slides used were simply inferior for such a forum. Zach has far better views of Idle Hour Neck and Beacon Towers hands down. Also the blog by HPHS (linked to OLI) which currently features the most incredible and highly informative piece on William Vanderbilts 640 Fifth Avenue is just astounding and scholarly and puts the SPLIA lecture about the home and its twin to shame. Maybe there are copyright laws to consider, but the lecture's visual content simply did not match the verbal content. I was there also and have to agree with Archibuff about the slides, I hoped for something a bit more, but the speaker was amazing!! I found him very enjoyable. LGB et al: The building close to the water was a boat house that Arthur Loew converted into a guest house in the late 1940's- and in the worst Palm Springs motel style possible. Arthur Loew moved to this beach house when he separated from his second wife in the mid 1950's. She refused to leave the main house, so Loew, I was told by his third wife, turned off the water and electricity to force the issue. He never moved back into the main house, but eventually built a smallish, ranch style house catty corner to this beach house into which he moved with his third wife. Zach...is this the boat house? I hope that horrible structure in the photos was not the fate of the photo you posted.